Who/What does the hangman represent? What lesson does the poem try to teach? And built his frame in the courthouse square. "Shall earn the rope of the gallows-tree." Was the gallows-tree in the courthouse square. Yesterday, with the foreign one?" Then one cried "Murder!" and one cried "Shame!" And we shrank back in quick alarm! Was a usurer, and an infidel. To help pull down the gallows-tree." "You lied to me, Hangman. Foully lied!" 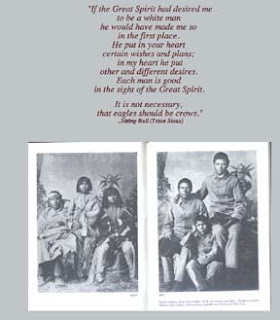 American Indians are still experiencing discrimination and disrespect. (See Changing Winds Advocacy Center http://www.changingwinds.org/ ) Do you feel racism is still being practiced in the United States? Why do you think this is or is not so? What cultures do you think are the victims of racism? How can you demonstrate respect for other cultures’ beliefs and practices? I believe that people show racism because times before we were born people practiced it so it just passed on from one generation to the next. Now after slavery, we have African Americans trying to reclaim there dignity and reputation in the world and are pointing their finger at the white people. On the other hand, the white people of today are sitting there saying it wasn’t my fault, it was the generations before me. Now we have a war to see who will come out on top. White Americans are looking at the black African Americans that live in the ghetto saying this isn’t the way an American should act or live while the blacks are saying the same thing. It also goes into religion. Muslims are fighting others who don’t want to plead to them and say that that is the way of the devil. You have Christians saying that the only way to get to heaven is to believe that Jesus Christ died for are sins and that you got to go by the bible so then they are saying every one who dose not believe in it will not see eternal glory so really it is a big battle of morals values and beliefs. I feel that racism is still being practiced in some place. There are Whites being hated on, and Blacks and Mexicans. It all depends where you are. This is because of how things were long ago. Some people still holding grudges. Others hate because of their pride or trying to fit in with others so they put on a show because of the way others do things. America was founded on the principles of liberty, opportunity, and justice for all, and on Veterans Day we recognize the men and women of our Armed Forces who have valiantly defended these values throughout our Nation’s history. 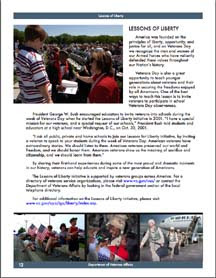 Write a paragraph about what you as an individual can do to demonstrate respect and honor for America’s Veterans.